Love to get your fingers sticky and get stuck into some serious arts and crafts? At Homecrafts they're sure to speak your language – and with a Homecrafts discount code you can enjoy fantastic savings too. So whether you're looking for activities to keep the kids entertained or something to scratch that creative itch, Homecrafts vouchers will help you save the pennies. The Homecrafts story started way back in 1907, when founder Harry Peach established Dryad Handicrafts. His aim was to establish a company that provided good quality arts and crafts materials and tools, encouraging people of all ages to try their hand at craft. The company grew in popularity over the years, and was rebranded as Homecrafts in 1994. Today, they stock over 16,000 products and supply materials to thousands of satisfied customers around the country every year. At Homecrafts their mission is the same today as it was a hundred years ago – to make crafting fun and accessible to everyone regardless of age or ability. They believe in the power of creativity, and want to encourage people to start making their own beautiful objects to treasure. To this end, they stock a fantastic selection of arts and crafts materials for a wide range of creative hobbies such as sewing, modelling, pottery, painting, papercrafting and much more. And because they believe in providing the right tools for the job, everything they stock has been thoroughly tested for quality and durability by their dedicated team of experts. At the Homecrafts online store customers can browse a wide selection of products, all available to search by category – so it's easy to find exactly what you're looking for. Love to sew your own clothing and want some fastenings and edgings to make your work look professional? At Homecrafts you'll find a wide selection to choose from, all at fantastic prices. Or perhaps you're looking for a basic kit to help introduce your children to the world of arts and crafts? At Homecrafts you can get stocked up on pens, paper, card, paints and more. And if you're stuck for inspiration you can even consult the team of experienced staff at Homecrafts – they're all passionate about arts and crafts and happy to give advice and tips on the best materials and techniques for you. Want to get shopping with Homecrafts? With a Homecrafts discount code you can enjoy big savings on their wide range of arts and crafts tools and materials. So whether you're a dedicated crafter or just dipping your toe into the world of creativity, a Homecrafts voucher code will save you money while you shop. Wide selection of arts and crafts tools and materials for a variety of hobbies and interests. Browse our website until you find a Homecrafts discount code that suits you, then navigate to their website to begin shopping. Enter your Homecrafts promotional code in the box provided and click 'Apply'. If you've enjoyed shopping with Homecrafts, you might also like to check out more great deals on more beautiful things for your home at stores like Dunelm or WorldStores. Or, if those aren't up your street, you'll find plenty more deals to browse in our Home and Garden section. Enter your Homecrafts discount code in the box provided and click 'Apply'. Click 'Go to secure checkout'. Choose 'Guest checkout' and click 'Continue'. Enter your details and click 'Proceed to payment details'. Enter your payment details and click 'Place my order' to complete your purchase. Standard UK delivery costs £2.99 on all orders. If you need to return a product for any reason to Homecrafts, you can do so by simply returning your items in their original condition within 14 days of receipt. Need to speak to the team at Homecrafts? Whether you have a question about your order, want some expert advice on the right materials for your favourite craft or just want to find out more about how you could make big savings with Homecrafts vouchers, you can contact the Customer Services department by telephoning 0116 269 7733. Want to find out more about your favourite crafts with Homecrafts? The company maintains a profile across all your favourite social media networks. Follow them for access to lots of exclusive content including competitions, special offers, creative hints and tips and more. You can also use this channel to find out more about saving money with a Homecrafts voucher code. Don’t forget to check them regularly, as you can never be sure when a free Homecrafts promotional code might be waiting for you! Buy now online at www.homecrafts.co.uk. I love to have arts and crafts days with my kids, but materials can be so expensive on the high street. That's why I was so happy to discover a Homecrafts discount code online. 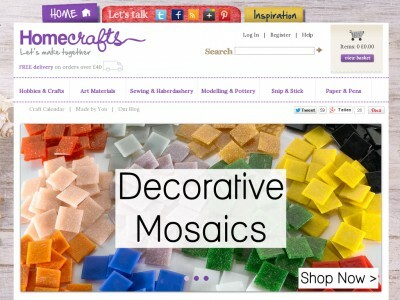 With Homecrafts vouchers you can get great deals on a wide range of materials, tools and equipment at homecrafts.co.uk. I used my Homecrafts voucher code to get an amazing price on some pens, paper and card to get my little ones started with crafting – and they love it! So why not see what you could save with a discount code?